Key West residential sales for April saw strong growth for the month overall, with median list and sale prices in particular moving closer to one another, highlighting the strength of the residential market for the region. The average list price for April 2018 was reported at $976,153 compared to $867,244 a year ago. This reflects a 12.56 percent increase. Average sale price for the month was $884,350, up by 16.5 percent from May 2017. Median list prices for the month came in at $656,000, up 1.08 percent from $649,000 in April 2017. While averages can vary greatly, median list prices tend to change over the long-term providing great insight into the midrange of home sales over an extended period of time. Another pattern worth watching for in median price data is how similar median list and median sale prices are at a given time. With April’s figures, the current median range of prices has come closer together when compared list and sale pricing. The median sale price for single family homes in the Key West area was reported at $675,000, up by 8.00 compared to April 2017 when the median sale prices was $625,000. A smaller gap between median sale and list prices indicates well-priced homes for the market. April’s sales report shows 59 properties sold in Key West, a few less than a year ago when 62 units sold. 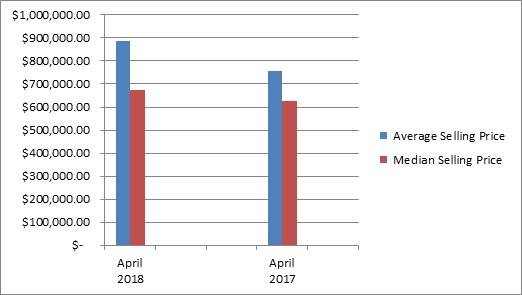 While there was a 4.8 percent decrease in the number of sold listings when comparing April 2018 to April 2017 sold properties, the YTD shows the steady demand is continuing. So far, for 2018 a total of 215 homes have sold, up 9.1 percent from a year ago. The number of pending list sales for the month came in at 54, down 16.9 percent from a year ago. 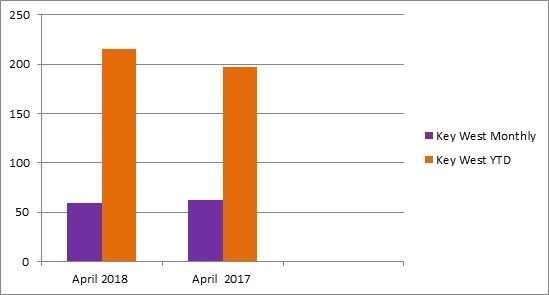 There were 544 active listings this April, compared to 624 in April 2017. The number of new listings added in April held steady at 76 compared to 78 last year. Year-to-date new listings are down a bit to 389 compared to 425 a year ago; active listings YTD went down to 874 compared to 965. With a lower inventory alongside ongoing demand for properties in the region, now’s a great time to consider listing. Another aspect to consider in listing your home includes the average and median days on the market. Homes sold faster in April compared to a year ago. The average days on the market for listings sold last month was 121 compared to 170 days last year. Median days on the market have gone down by more than two weeks to 53 days compared to 71 in 2017. The decreased time on the market reflects the demand for homes in the area. As we get into longer days and the approach of summer, we anticipate homes will continue to move faster.